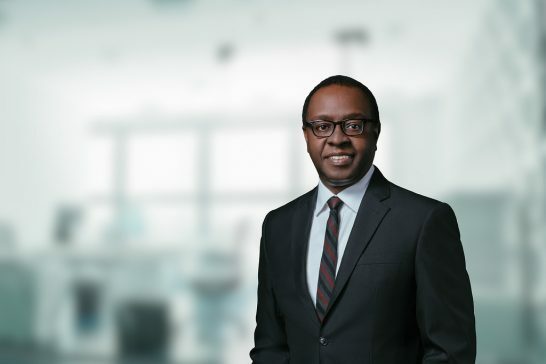 Home > Attorneys > Oscar N. Johnson, Jr.
Oscar N. Johnson, Jr. has served as Managing Partner and Global Managing Director of Higgs & Johnson since 2012. He is chair of the Litigation practice group and practises a full range of corporate and commercial law, specialising in commercial and civil litigation, admiralty law, insurance, and employment law. Oscar regularly appears in the Supreme Court (High Court), and the Court of Appeal of the Commonwealth of the Bahamas, and has appeared before the Privy Council. Oscar has appeared as Counsel in a number of important international cases including: Slim America, Inc.; Premium Sales Corporation; Globe-X Canadiana and Globe-X Management; Americas International Bank (In Liquidation); Debtworks, Inc, and Suisse Security Bank & Trust and as Junior Counsel in Grupo Torras. He has acted in various matters including; a $22 million damages claim relating to the allision of a bulk crude oil tanker with a terminal jetty; a project related to the $32 million restoration of a production facility; an action by underwriters to avoid a directors and officers policy of insurance in the sum of $1.5 million; a matter in respect of a damages claim in the amount of $16 million by a developer against the adjoining property owner of a distillery. 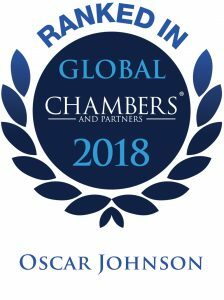 In 2017, his legal work in landmark court actions which clarified the principle of freedom of contract to limit liability in commercial maritime agreements in cases involving collisions, or allisions globally led to the firm’s selection as a finalist for the Law Firm of the Year category at the 2017 Lloyd’s List Americas Awards. Oscar has authored Bahamas-specific chapters in “International Professional Practice” and “The Use of Videoconferencing in The Bahamas”. He has served as a member of The Bridge Authority, the Disciplinary Tribunal, the Arbitration Tribunal, as advisor to the Nassau Tourism & Development Board, and on the Board of Directors of St. Andrew’s International School. He is a member of the International Bar Association and Bahamas Bar Association where he previously served as a member of the Ethics Committee. 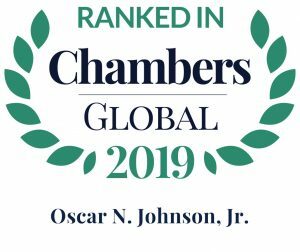 Chambers Global 2019 ranks Oscar as a leading lawyer in the General Business Law: Dispute Resolution practice. Having obtained the Diplome d’Etude Collegiale John Abbott College, Ste Anne de Bellevue, Quebec, Oscar went on to study History and Political Science at McGill University, Montreal, Quebec, Canada, graduating with a Bachelor of Arts degree in 1982. In 1984 he obtained an LL.B. (Hons) from the University of London, School of Oriental and African Studies in England. In 1985 he was called to the Bar of England and Wales as a member of the Honourable Society of Lincoln’s Inn and to the Bahamas Bar. Oscar joined Higgs & Johnson as an Associate the same year and became a Partner in 1992.